This evening I grilled sea scallops for dinner. I found some beautiful wild caught scallops last night at Costco. 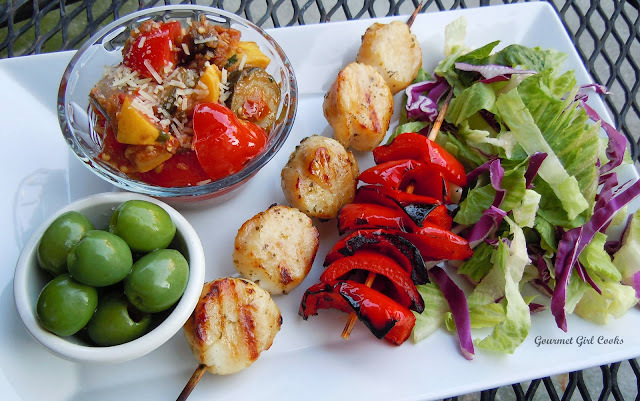 I decided to keep them fairly simple so that the seasoning enhanced the delicate flavor of the scallops without covering it up or overpowering them. I patted the sea scallops completely dry and then threaded them onto bamboo skewers (that had been pre-soaked in water to keep them from burning up). I melted about 3 tablespoons of Kerrygold Garlic & Herb Butter and added the zest and juice of one small lime, about 1/4 teaspoon of Celtic sea salt and 2 generous dashes of ground chipotle chile pepper. I brushed the scallops with the chipotle garlic lime butter and grilled them for about 4 minutes on each side. 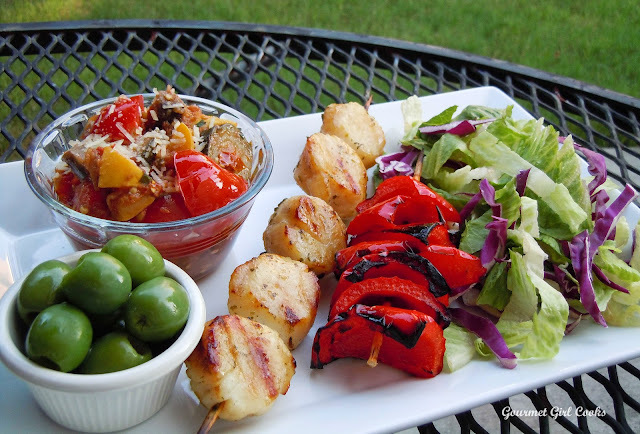 I also grilled some red bell peppers to go with our scallops and served them with a side salad and some leftover ratatouille from Thursday night's dinner. Also, while at Costco last night, I decided to pick up a jar of some of the most unusual looking olives I have ever seen...they are a bright, almost fluorescent green and I eye them up each time I go. While I am not a huge olive fan...hubby is. He loves olive bars in specialty stores and markets, much the way I used to love the array at the "bar" at the Godiva store...LOL. Anyway, I have never seen these olives anywhere else before and had read that they were more rare and might be found on olive bars that carry a wider array of olive types. They are called Castelvetrano olives and they are brined instead of cured which makes them somewhat "crisp" and well as unusually bright colored. 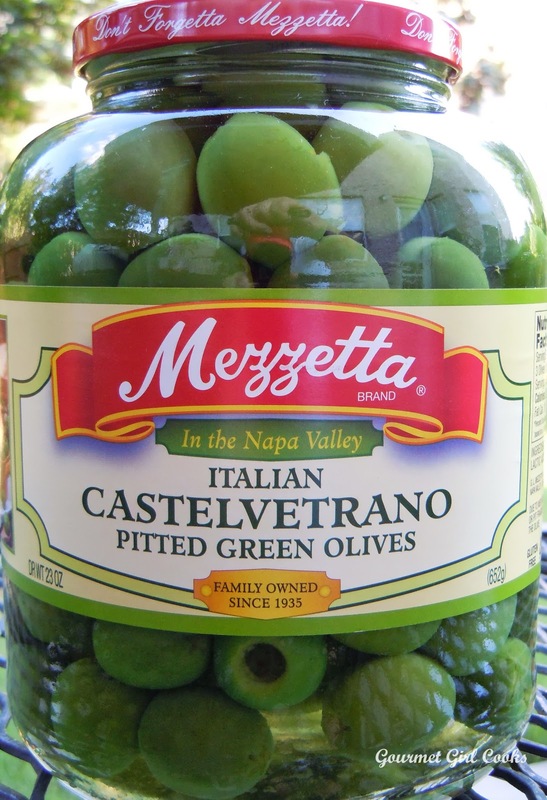 According to Mezzetta (the brand that I purchased), they are produced exclusively in Castelvetrano, Sicily. Hubby really liked them and while I thought they were good...I am just not an olive person...but I am REALLY trying to be more so of one. If you are interested in reading about these unusual olives, I have linked some information here: Castelvetrano Olive Information. I love learning little known facts like that. 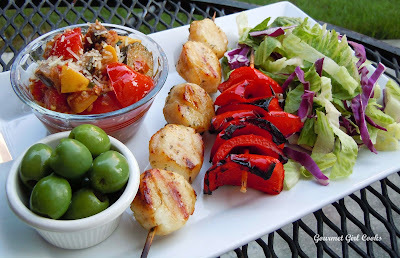 I snapped a few photos of our dinner...it was simple, fresh and delicious. Enjoy! 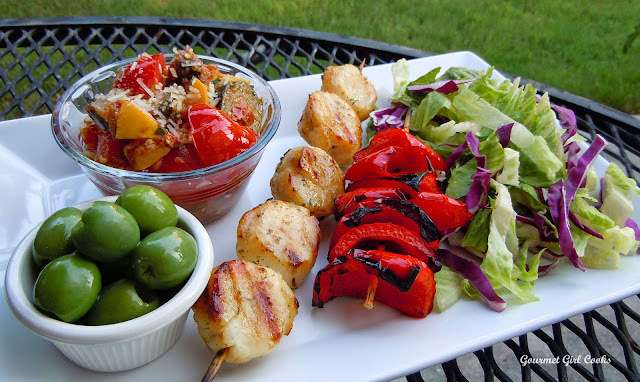 I saw those scallops at Costco and they looked so good! They are on my list for next time. I bought some olives there, too, but not the Castelvetranos (I got some of those at an olive bar a while back ... I'm one of "those" people who like olives, LOL. The ones I bought at Costco were called Greek Olive Salad, or something like that (I've already thrown the container out.) A word to the wise ... when I opened the container and tasted them, they were drenched with the most awful oil and some weird tasting spice or "whatever." I'm usually good about checking labels at the store, but not this time. It was *canola* oil and was it ever thick and yucky, almost like motor oil! I did manage to salvage the olives, though, by rinsing with lots of HOT water and draining them very well. They're vastly improved ... good thing, or they'd have been in the trash! At least they're now in an edible state and in a *glass* jar. I'll be able to nibble at them till they're gone!